A great way to experience the back-country, take the Canmore snowmobile tour shuttle to Golden, just west of Yoho National Park, for a full day of adventure and excitement. You will be shuttled through the majestic Rockies from Canmore to the snowmobile base. The video below is just a snapshot of what to expect on this snowmobile tour. 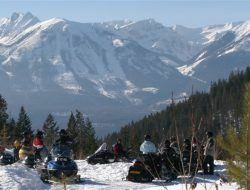 There is no pressure to go fast or slow making this Canmore snowmobile tour very family-friendly.